Something Sweet for Raya Open House? Try Rainbow Rolls! 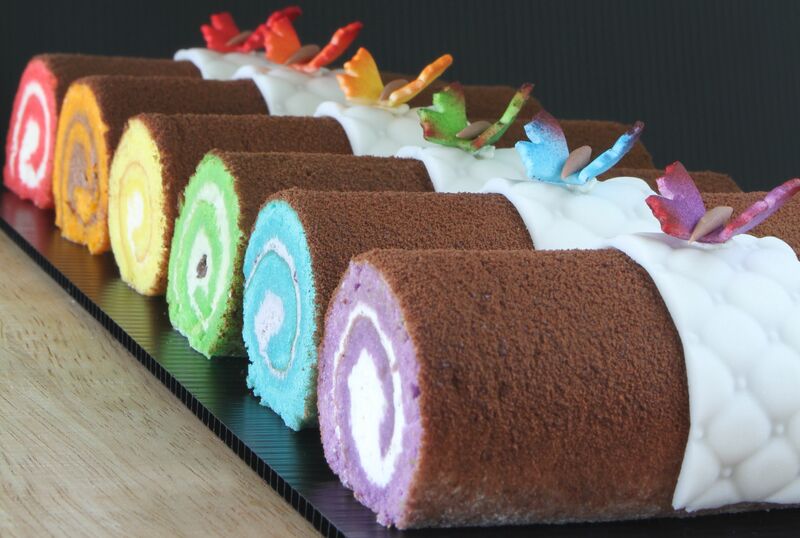 Impress your Raya Open House guests with these colorful rolls. Each roll features different fillings, so your guests can enjoy a variety of choices. Line two 23x 33cm (9x13”) rectangular baking trays with greaseproof paper or silicone sheet. Preheat oven to 190°C. Whip eggs, egg yolks and 100g sugar until thick, pale and fluffy. Whip egg whites separately and add the 50g sugar gradually while whipping until soft peaks form (meringue stage). Add the meringue into the egg mixture and fold in sifted flour. Divide mixture into 2 portions and colour one red and the other orange. Repeat the above process to make another 2 batches of batter, colouring one batch yellow and green, and the other, blue and purple. Combine glucose and cream; heat up and pour onto the chocolate. Mix until chocolate has melted and then add butter. Set aside to cool. In a saucepan, boil the lemon juice, lemon zest and 80g sugar. Mix egg yolks with the other 80g sugar, add in the cornflour and then the eggs. Pour a little of the lemon mixture into the egg mixture and mix well. Put this mixture back to the lemon mixture in the saucepan and cook over low heat to bring to a boil. Re-move from heat and stir in butter. Set aside to cool. Whip cream until soft peaks form and add chocolate ganache. Whip cream until soft peaks form and add lemon cream. Whip cream cheese and whipping cream together until soft peaks form. Whip cream until soft peaks form, add green tea powder and red beans. Whip cream until soft peaks form and add blueberry filling. Split the vanilla pod and scrape seeds into the cream; whip until soft peaks form. Melt the couverture and cocoa butter together. Spread the respective fillings according to the colour of the sponge. Cut each frame into half and roll up. Refrigerate. Spray the cold rolls with chocolate using a spray gun and decorate as desired. An alternative to spraying chocolate would be to roll the sponge rolls in sifted cocoa powder.